Comedians Benari Poulten and Gastor Almonte join Negin to give their initial takes and takeaways from the recently released (and redacted) Mueller Report. Then they discuss how the Notre Dame fire reflects our own mortality, whether the rebuilding effort is a good use of resources, and one time Negin got stoned in France. This episode is sponsored by Pact (www.wearpact.com code: FakeTheNation) and ThirdLove (www.thirdlove.com/NATION). Hayes Davenport and Griffin Newman join Negin to discuss as many of the Democratic presidential candidates as they can get through. Then they ask if America is actually “full” (it's not) and how should we deal with former DHC Secretary Nielson (the jail from the Dark Knight Rises)? This episode is sponsored by Harper Collins - #IMomSoHard, Paint Your Life (text FAKE to 48-48-48), and Care/of (www.takecareof.com code: FAKE50). Connie Wang and Christian Finnegan join Negin to talk about the problem with Joe Biden and if him running for president would be a good or bad thing. Then, why is AOC so famous and does her celeb status impact her ability to be a politician? Finally, social media influencers: who, exactly, are they influencing? This episode is sponsored by Harper Collins - #IMomSoHard, Pact (www.wearpact.com code: FAKETHENATION), and LivingProof (www.livingproof.com/FAKE code: FAKE). From a train station in Boston, Negin is joined by Benari Poulten and Seena Ghaznavi for a discussion on the release of the Mueller Report, expectations versus realities and what democrats should do next. Then, we open the Fake the Nation Vault and hear conversations with Selena Coppock, Jena Friedman and Dave Hill. This episode is sponsored by Vistaprint (www.vistaprint.com/FAKE), Paint Your Life (text FAKE to 48-48-48), and CBS - The Good Fight (www.cbs.com/FAKE). This episode is sponsored by Vistaprint (www.vistaprint.com/FAKE), Pact (www.wearpact.com code: FAKETHENATION), and CBS - The Good Fight (www.cbs.com/FAKE). Jenny Kaplan (Wonder Media Network) and Cody Lindquist (Our Cartoon President) join Negin to discuss Trump’s seemingly endless CPAC speech, death on Facebook, Facebook’s death and lastly, confidence; what is it and how do you get it? This episode is brought to you by Island of the Hungry Ghosts, Pact (www.wearpact.com code: FakeTheNation), and The Good Fight (www.cbs.com/FAKE). Negin is joined by comedians Dave Hill and Jena Friedman to discuss a recent white-haired addition to the 2020 presidential race, updates on the Mueller investigation, and Amazon’s recent decision to no longer move to NYC. This episode is sponsored by The Harold Ramis Film School (www.ramisfilmschool.com or call 312-883-1241) and Pact (www.wearpact.com code: FAKETHENATION). Negin is joined by comedians Seena Ghaznavi and Selena Coppock to talk about the proposed Green New Deal, Valentine’s Day, and three powerful women in the news: Amy Klobuchar, Kamala Harris, and Ilhan Omar. This episode is sponsored by Vistaprint (www.vistaprint.com code: FAKE). Negin is back (hooray!) and joined by Fake the Nation favorites Baratunde Thurston and John Fugelsang. They tackle Trump’s SOTU & crooked tie, then turn to the recent deluge of incriminating photos from the past and why “cancelling” a human being isn’t always the best course of action. Finally, is millennial burnout a thing and if so, who is to blame? 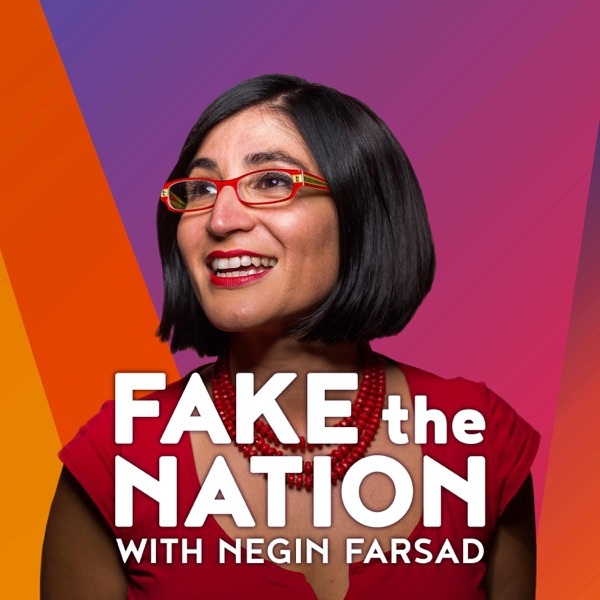 Guest host Benari Poulten is joined by Fake the Nation regulars Christian Finnegan and Leah Bonnema for Negin’s final show away on maternity leave. Topics include Roger Stone’s recent indictment, if anything can be done about America’s desensitization to violence and the polar vortex's place in the discussion of climate change. It's funnier than it sounds. This week, Earwolf's "Yo, Is This Racist" hosts Andrew Ti and Tawny Newsome take over for Negin. They're joined by Joel Kim Booster (Big Mouth) to find some unexpected sympathy for TSA workers affected by Trump's shutdown, rage about the trans military ban and discuss the melange of scandals surrounding the Oscar nominees. While Negin continues her maternity leave & masters the art of strategic napping, guest host Jody Avirgan (ESPN's 30 for 30) chats with Maeve Higgins and Josie Long for a big think on how the rest of the world views the USA. Then, the three do their best to make sense of the recent Brexit developments and analyze the backlash to a new Gillette commercial. Negin is joined by Dan Pashman who presents a tale of identity, politics, and food. This story of a woman searching for her roots through the meals of her home country originally aired as episode 255 of The Sporkful on Stitcher. This episode is sponsored by G.H. Mumm (www.ghmummvictory.com), Care/of (www.takecareof.com code: FAKE) and HelloFresh (www.hellofresh.com/FAKE60 code: FAKE60). Negin begins a much needed a holiday break in this episode featuring an cast of Fake The Nation All Stars. Negin is joined by Catie Lazarus, Benari Poulten, Carolyn Castiglia, Sydnee Washington, and Alissa Walker to talk about the beautifully complicated subject of having, raising, and genetically modifying children. This episode is sponsored by G.H. Mumm (www.ghmummvictory.com), Living Proof (www.livingproof.com/FAKE code: FAKE), and Blinkist (www.blinkist.com/FAKE). Aaron Jackson (The Opposition with Jordan Klepper) and Maeve Higgins (New York Times) join Negin to discuss the possible impending government shutdown and Trump’s recent clash with Nancy Pelosi’s burnt orange power jacket. Then, they do their best to make sense of Brexit, and Kevin Hart’s short stint as the future host of the Oscars. This episode is sponsored by G.H. Mumm (www.ghmummvictory.com), Matangi/Maya/M.I.A, Modcloth (www.modcloth.com code: FTN), and Thoughtfully (www.thoughtfully.com/FAKE code: FAKE). This episode is sponsored by LivingProof (www.livingproof.com/FAKE code: FAKE) and G.H. Mumm (www.hmummvictory.com). Matt Rogers (Las Culturistas) and Leah Bonnema (Comedy Drop) join Negin to discuss Paul Manafort’s 2016 meeting with Julian Assange and if new developments in the Russia probe will affect Trump politically. Then, they talk maternity leave in the U.S., and finally, Lena Dunham and Gina Rodriguez's recent attention-grabbing interviews. Jason Selvig and Davram Stiefler of The Good Liars join Negin to discuss Matthew Whitaker and what his appointment as acting Attorney General could mean for the Mueller investigation. Then, they talk Thanksgiving and if getting drunk around your family is a good idea. This is the perfect episode for tuning out your uncle’s hot takes this holiday. This episode is sponsored by BeFrugal (www.befrugal.com/FAKE) and Thoughtfully (www.thoughtfully.com/FAKE code: FAKE). Josh Sharp (The Opposition) and Greta Titelman (Lady Lovin' podcast) join Negin to dissect the midterm results and their implications. Then, they discuss if the economy is doing as well as the numbers make it seem. Finally, with Russian meddling in our past and possibly present, they give their predictions for our future relationship with social media. This episode is sponsored by Blinkist (www.blinkist.com/FAKE). Catie Lazarus (Employee of The Month) and Alissa Walker (Curbed, LA Podcast) join Negin to discuss a truly terrible week and how much the current political climate has to do with it (spoiler: a lot). Then, they discuss whether or not stories like Trump’s threat of ending birthright citizenship are just noise that don’t even merit reporting. Finally, with the midterms around the corner, the trio discuss a New York Times piece on how to turn someone into a voter. This episopde is sponsored by Vistaprint (www.vistaprint.com code: FAKE), Care/Of (www.takecareof.com code: FAKE) and Away (www.awaytravel.com/FAKE code: FAKE). Comedians Keisha Zollar (The Opposition) and Michael Cruz Kayne (The Exhibition) join Negin to discuss reports that the Trump administration is considering a narrowing of the definition of gender. The proposal would effectively erase protections for trans people. Then, the panel chats about the ‘pink wave’ and if the term treats female candidates as a novelty. Finally, they unpack the growing trend of smart assistants such as Alexa. They ask: Is convenience worth the price of privacy? This episode is sponsored by Sierra Club (www.beyondcoal.org/stories), HelloFresh (www.hellofresh.com/FAKE60 code: FAKE60), and Nutrafol (www.nutrafol.com code: FAKE). Cristen Conger (Unladylike) and Benari Poulten (The Nightly Show) join Negin to discuss the geopolitical implications of the missing Saudi Arabian journalist Jamal Khashoggi. Then, the panel asks: If the Democrats win the House, is a quest for impeachment politically savvy? Plus, they unpack New York Times critic Wesley Morris’s essay “The Morality Wars" and how social justice and representation impact how we talk about art. This episode is sponsored by Harper Collins Children's Books, Newsvoice (www.newsvoice.com/fake), ModCloth (www.modcloth.com code: FTN), and Blinkist (www.blinkist.com/FAKE). Comedians John Fugelsang (Tell Me Everything) and Ann Herberger join Negin for a wide-ranging chat about the looming midterm elections and the the abysmal UN climate report. Plus, in the wake of the Kavanaugh hearings, they ask: is there still a sexist double standard on who is allowed to be angry in public? Lastly, Ann shares her take on being a Republican woman in the midst of the #MeToo movement. This episode is sponsored by Sierra Club (www.beyondcoal.org/stories), Newsvoice app (www.newsvoice.com/fake), Harper Collins Children's Books (www.thehateugivebook.com), and Joule: Sous Vide by ChefSteps (www.chefsteps.com/joule code: FAKE).